My baby doll turns TWO! She Art Canvas....She kept on going anyway. We all know the power that words can have on us. The power of words, especially those written about the everyday happenings of life...the good and the bad are what truly inspire me. This life is full of both joy and sorrow and I am so grateful to all of you brave women (and men) who are willing to share what is making your world go round...or even stop for awhile. This is the stuff that matters and your stories, your photographs, your creations and just the simple words you write are a blessing! I hope that I can get back to doing my own blogging. I miss writing and sharing my story. I think it is important on so many levels....journaling, memory keeping, creative sharing, etc....but more importantly, I have realized that you never know who out in the world needs to hear just exactly what you have to say. I have been both helped, guided and inspired through reading blogs. For that I am truly grateful. Baby Sophie (now little girl Sophie) turned TWO on Saturday! I am still in a bit of shock about how quickly the time has passed. I have worked hard to savour and enjoy every precious moment, but I have to admit, so much of my pregnancy and her first year is a blur due to personal hardships I faced. She is a true gift from God himself. He handed her down to my arms to show me that he understands and that he does make things right. God answers prayers. This I know for sure. Sometimes they don't happen on a timeline that we can understand, but the most important lesson I have learned is too have faith in His timing. I am grateful beyond measure. Now...to the birthday bash we go. Welcome to Sophie's Sweet Shoppe! I love to create garlands for birthday parties and I had taken so many photos from Sophie's birthday invite shoot, that I decided to create photo garlands with the shots. My plan was to string them around my entire deck (because hello, I have about 250 photos of her!) but I just ran out of time. I have enough candy left over to last a year...maybe more. Hit me up if your sweet tooth needs a fill! My friend Michelle designed this beautiful cake for Sophie. Isn't is awesome? She is very creative and does a fantastic job! If you are local...hit her up if you need a showstopping cake for your next shindig! Many of the pictures I have of Sophie are of her drinking all sorts of sweet drinks. She must have had 5 or 6 soda bottles hanging around the party and was always thirsty! I just loved how her birthday outfit turned out. I bought the fabric and patterns from My Girlfriends Quilt Shoppe in Logan. My friends Kim and Kris own it and it is FABULOUS. Kim and Kris are very talented ladies who also run several web sites including The DIY Dish and You can make this. You must check it out the shoppe if you are in Cache Valley and of course, their web sites are amazing. The crown pattern is from The Quilted Fish. Darling isn't it? So fun to make. The skirt pattern is called The Nie Nie skirt from Pink Fig Designs. It took some time to make...but well worth it. Sophie looked adorable in it! Happy Birthday Princess Sophie. I hope your day was fun and although you probably won't remember it, I hope you will carry the feeling it gave you and know how much you are loved by your family and friends. Life just wouldn't be the same without you in it! Love you baby girl. Now that I FINALLY have my little girl...I have a great desire to make her lots of pretty clothes...especially for special occasions...but my busy life and lack of time don't seem to let me realize that need very often! I had totally planned to make Sophie's Easter Dress this year...but time slipped away. Since I am trying to budget my money better...I didn't have much of anything to spend on the kind of dress I wanted for her. I decided to get creative and work with a pretty little basic dress that I found at the Deseret Industries (thrift store similar to the salvation army). This is what I started with...minus the layer of tulle AND it had a horrible dirty yellow silk flower right in the middle that I removed. ( I didn't think to take pictures until I was into the process). I bought it for just 3.00....it was gently used and had a really great structure. So I decided to head to my lovely stash (a rather large stash) of trims and see what I could make of it. Now this was Saturday afternoon about 3:30...so I still didn't have a lot of time to do exactly what I wanted...but I was still pretty happy with how it turned out. I ADORE my little Sophie! Isn't she a sweetheart? I bought the hat at T.J Maxx for another 3.00 and added trims to it as well. Now let's not forget my HANDSOME boys! I am so excited to be doing Christy's online course The She Art Workshop. I am loving creating mixed media and started to dabble in it back in August...I have done a few canvases and some other things here and there...but this is an incredibly awesome way to learn so many new techniques! Christy's course is amazing...and so is she! Her next She Art course launches April 11th and it is so worth the money for 3 awesome weeks full of content, inspiration and community with lots of other women from around the world. Also check out her totally rad online shop...The Scarlet Lime for anything and everything you might need to get creating. This is my first She Art Canvas, and the phrase pretty much sums up my life at this point in time. I'm really loving how it turned out...although I must say I was a little worried throughout the process...you just have to keep going anyway! You never know what you are going to end up with! I am going to change her hair color to blonde...since I am a blonde. I didn't have the right color when I finished up last night...but now I do! Wow...two posts in one day. 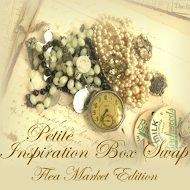 I have the most fun creating and recieving inspiration swap boxes hosted by Heather at Speckled Egg. The theme of her most recent swap was the Flea Market Edition. I said a big enthusiastic yes to that! To do the swap, Heather puts us in groups of 3 and based on each others styles, likes, fav things, etc...we create a personalized box full of creative goodies for each of our partners. I recieved my fabulous boxes from Jessica and Christine this last week and they recieved mine as well! I still need to take photos of the boxes I recieved...so that will have to come in another post....but LOVE! For now...I wanted to share the boxes I created for my partners. Just wanted to share the Valentines I made for my children this year. They were so fun to create...especially because I really love how our MM Je t'Adore collection turned out! It's so much fun to craft with and totally my style with the French theme, cabbage roses and the romantic, soft feel. Once the kids are done eating all of there valentine goodies...I am going to put the heart pouches in their scrapbooks (each one is a 12x12 heart) with a letter inside telling each of them just how much I love them and what things are special to me about them right now at this point in their lives. Hope you all had a lovely Valentines Day! The Pioneer Woman that is. I just think she is pretty much the coolest chick around. Ree Drummond, better known as The Pioneer Woman has got it goin on in her fab life. If you haven't heard about her...it's just possible that you may have been living under a rock. Not that there's anything wrong with that :). Why do I love her so? Read her blog/web site for just 2 minutes and you will get it. First of all...she endearingly refers to her uber-hot cattle-rancher husband as "the Marlboro Man" (he doesn't smoke). I love it. She talks about him with such adoration and lust. Yes! Lust! She is extremely witty in her writing and damn is she a good writer. She homeschools her four children and is an amazing cook and photographer among many other talents. She's beautiful, smart, fashionable, talented and is also devoted wife and mother. She loves and adores people and is an all-round genuine and gracious woman. And...did I mention that she is married to a cowboy? Hot. As I have been working on my blog and reading the blogs of many amazing women...like The Pioneer Woman...I am reminded that there are some pretty incredible ladies on this earth who truly are here to inspire us on our own journey's through this life. Whether we have a Marlboro Man or not...whether or not we are good cooks or great photographers or even if we are not as great as expressing ourselves as she is. We have guides and role models such as Ree to help lighten our spirits, ease our burdens and inspire our lives on a daily...sometimes hourly basis all thanks to twitter and facebook! I just love and admire The Pioneer Woman. I have been so busy working on new products for MM lately that I haven't had a chance to do much of anything for myself or my kids. But I really wanted to create at least one valentine project before the 14th and I pretty much love how it turned out. And...it was easy :) I used our Je 'tadore Chandelier Kit which you can find here. Since I am loving garlands and banners these days, instead of creating the chandy, I created this garland which adorns my fireplace. Like I said...very easy. All the pieces were already cut and ready to go. I just had to sew together the 3 shapes using back to back hearts of doves. That way...when they are all connected together you can fold them out to give them some dimension. The kit comes with four picture hearts...well I have just three children so I decided to use one of them twice and I figured that since Vday is really a "girl's" holiday that little Sophie would get the honor. Well...Ethan (pictured above) was not too happy about that and told me emphatically that it was not fair. He is insisting that I change out one of Sophie's pictures and put one of myself or his Dad...or even better..the both of us. Since his dad and I are not together, I don't think that is going to happen :). So I'm just hoping that he is going to forget about it! Cute kids right!!! I think so :) I am going to create some cute Valentines for my kids this year...so hopefully I will be back soon with more blogging and craft fun. I'm also working on creating a new look for my blog....so stay tuned. Hope you all have a fantastic weekend! I love the smells of the holidays and look forward to lighting up a fresh new candle each season. When I go to the store I smell all the new scents but I am always drawn to one particular scent...pepperberry wreath. It is nostalgic for me and brings me so much comfort. There is something about the smell that reminds me of the holidays during my childhood. So today I am grateful for the beautiful scent of pepperberry wreath. It just warms my soul. So every year at about this time I start thinking about finding matching Christmas Pajamas for my kids. It's become sort of a challenge having an almost 15-year old son, a 6-year old son and a 1-year old daughter! My oldest, Brayden, probably doesn't care much anymore for matching with his little brother Ethan. Now that I have Sophie...it opens up a whole new world of jammie possibilities! So...I am on the hunt. If you have any ideas for me or you see something awesome that would work for all 3 of my kids...let me know! Most likely...I will do some sort of coordinating pj's for the boys to work with whatever I fall in love with for little Sophie! I found these cute cute long john style PJ's at RedEnvelope. Aren't they so so adorable! I love that little baby too! So dang cute! RedEnvelope is actually a pretty awesome place to find gifts for pretty much everyone on your list. What I love is their keepsake gifts for most any occasion you can think of. They have beautiful jewelry boxes, blankets, and stuff for guys also. Love the new Christmas gift ideas they have this year!